We do our best to predict the outfit ideas that'll reach cult status every season, but there are always a few new ones that surprise our editors. Where 2018 was full of wacky trends, the stylish outfits emerging at the top of our lists this year are rather pared back in comparison—and we're enjoying how well the latest looks can be translated into our own wardrobes. Where last year we saw head-to-toe animal print, this year is all about beige. Ugly trainers have been replaced with minimalistic shoes. Edgy has been usurped by pretty or practical. It just feels like there's a refreshing wave of original looks popping up on our feeds this season, and they don't feel overly "fashion" or unattainable on a budget. These outfits are wearable in day-to-day life while still pushing us out of our comfort zone. They work for spring and will easily translate into summer weather too. This doesn't mean you should disregard your sense of adventure when it comes to new looks. It just feels like this season, there's less sartorial pressure to do so. Keep scrolling to see and shop the five most stylish outfit ideas of the year so far. There are always more to come, after all. 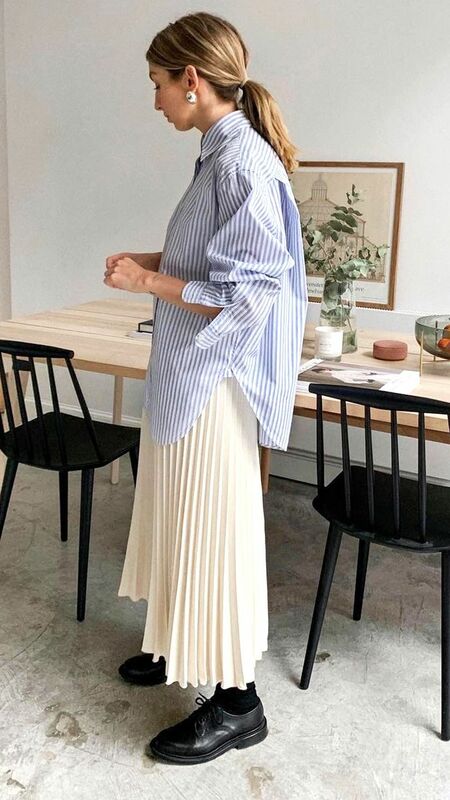 Style Notes: Brittany has single-handedly convinced the fashion world to buy this Arket pleated skirt, and she keeps proving why in her fresh outfit ideas. Keep it simple by playing with shape, like an oversized button-down shirt. Style Notes: Perhaps the easiest route to chic this season is this outfit formula that Monikh has championed for some time. If the ease of it isn't enough to convince you, imagine how happy your feet will be to embrace chunky black sandals every day. Style Notes: All-beige outfits were everywhere at London Fashion Week and have been our go-to for easy chic ever since. Stick to tailored pieces to keep it classic. Style Notes: Jeans and a nice top is the gift that keeps on giving. This year, try going for a monochromatic look, or perhaps swap your go-to for an organza blouse or leather shirt. The combinations are endless, and that's why it's forever stylish. Style Notes: Be it a short prairie dress or one with puffed sleeves, this outfit combination is as easy as it is breezy. Try cowboy boots or play with volume for a trend-based challenge.